Rally – It’s fun and you can do it! ASCA Rally Trials are designed to allow teams with all kinds of goals and abilities to meet and compete in an atmosphere of camaraderie. Training for and competing in ASCA Rally not only adds to your team’s skillset; it builds strong bonds between you and your dog. If you are a newcomer to Rally, be ready, lasting friendships often develop! 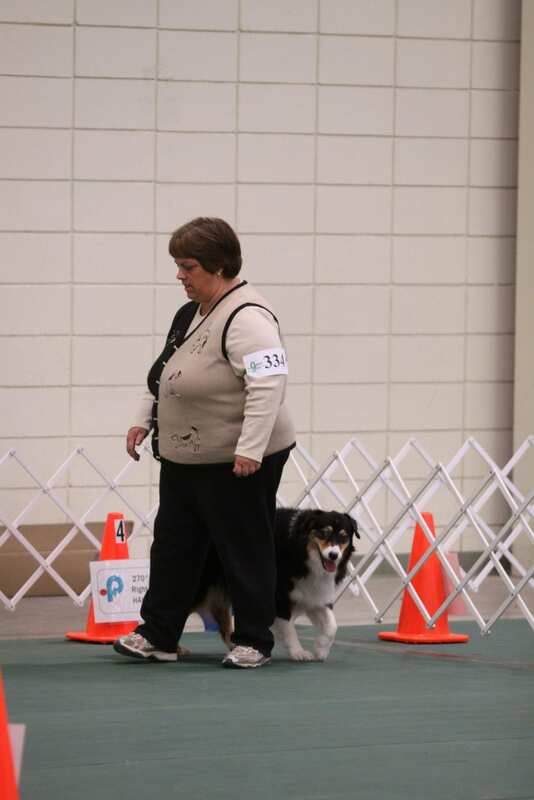 ASCA Rally is a sport that focuses on the partnership and teamwork that develop between dog and handler. Commonly referred to as a “team,” the dog and handler are required to complete a course consisting of a set of exercises designed by a Judge according to the current ASCA Rally Rules and Regulations. All teams are held to the same standard of performance. Courses are to be executed as one continuous performance, moving fluently between well-marked stations without additional instructions from the Judge. While a team is on the course, they should exhibit accuracy, briskness, and smoothness with enthusiasm and enjoyment. Good Times and Good Sportsmanship are the rules of the day. ASCA Rally has four levels of competition with three titling opportunities at each level: a base title, an “X” title, and a “C” title. There are other titles available to work toward after the base titles culminating with the Rally Trial Championship (RTCH) for those teams aspiring to such heights! See the Rally FYI page for additional information about the levels of competition and recognition readily available to every ASCA Rally exhibitor. Our Rulebook is available to read online for more details about the Rally Program. To obtain a printed copy of the rulebook, please contact the ASCA Business Office at (979) 778-1082. Positive teamwork and a commitment to training are requirements; but you may establish your own goals. Come, play, have fun, end up with a “better” dog. Come, play, have fun, work hard and earn titles along the way. Make no mistake, high level titles and championships require work, time, and training. However, the rewards go far beyond show placements. Rally might be addictive, but its side effects are all good… a better trained, more engaged dog, and a happier dog and family. This rewarding journey is time well spent, with fun and experiences shared along the way. RALLY!, the real deal for real people with real dogs. Rally exhibitors come in all shapes, sizes, and abilities, each with individual goals. The ASCA Rally Program has a place for everyone having the desire to “do something” with their dog. Rally is a sport that encourages you to talk to and enjoy your dog in the ring. Some teams are there just for the fun. Others decide that earning titles along the way is a great way to keep score or track their progress. Some are there with a firm vision for a Rally Championship in mind. All are there for the love of the dog. You can start with the dog you already have. While we hope you will become as engaged with Aussies as we are, please remember that the ASCA Rally program is open to all breeds and mixed breeds! Click here for details about ASCA Membership, Tracking Numbers, and Service Memberships. Rally recently was accepted into ASCA’s MVA, MVJ and Hall of Fame designations. To find out how rally fits into those programs, please visit their sections of the website.